We bought a sleeper class ticket for the same day at 23 o’clock. Goal – Goa. Destination station for rail travel – Karwar. We had to reach the destination at 12.45. Delay was not large. It turned out that Karwar is in Karnataka state not Goa. Itr turned out to be a small station from which you could reach the town by rickshaw or by bus. It was 4 km away. The price for our six in the rickshaw was 80 rs without negotiation, the ricksha man claimed that the distance was 7 km. Karwar is a small town. Belongs to Karnataka state and by train from the south to the north Karwar is the last stop of Karnataka, then Goa. 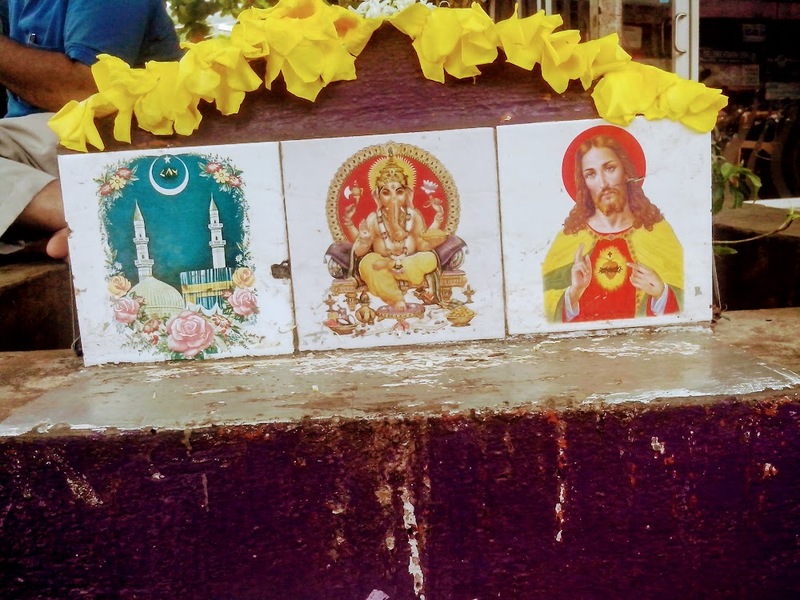 Karnataka, like Goa, is inhabited by followers of hindu, islam and christian religion which is nicely presented on such placards in public places. During the train journey through Karnataka we admired enormous areas of undeveloped (at least along the railway line) greens, waterfalls and hills and unbelievably blue-green rivers. However, it wasn’t for us. The ATMs did not want to cooperate with our cards and to not stay out of cash we went back to our previous plan: Goa, where beer costs pennies. We got in Karwar on a bus going to Margao whitch is the first town on Goa as a destination. The first village in Goa was Canacona (Chaudi), a large village. The journey from Karwar to Chaudi lasted about an hour. At the time of the exit, we were greeted by a heavy rain, so we quickly hid under the peak of the closed Vodafon shop. The most important thing for us at the moment was to get some cash so my father went on research. The downpour, however, did not last even 10 minutes, and soon after it was hot. Goan monsoon. This time ATMs cooperated, equipped with rupees we decided to look around for accommodation. We walked with the backpackers in the direction of beach. After about two kilometers, it turned out that the so-called beach was the shore of the lake that was fishing ground of the local fishermen. In the fishing village Tarir, however, we found a nice bar where you could relax with cool drinks. The bar also offers scooter rental and accommodation assistance. Having finished our drinks we went ahead, where the road ended on the shore of the lake or bay. Having studied the facilities on the horizon above the water we found that the beach had to be “somewhere” there. We decided to temporarily stay in a small guest house nearby. Having dropped backpacks there, we went to the neighboring village of Patnem, which has more offers of resorts, accommodation and – most importantly – access to the beach. We found the house, but we did not get to the beach, as it was a;ready dark. In Patnem almost every household is offering accommodation for tourists. South Goa is a former Portuguese colony and its specific feature is the ethnic origin of its inhabitants. The people there are mostly christian. At this time of the year – august, september – fish and shrimp season is in progress. The seafood can be bought in Chaudi fish market at good prices. Fish and seafood are the main source of protein for the locals, the hen is cooked in the holidays. We immediately bought some sea food. Shrimp were hugeand half of them was eaten raw, the rest were fried. The culinary curiosity turned out to be a shark. For five small sharks we paid 100 rs. It was tasty, but had an unpleasant taste.